A spurt of Whitney Houston news has graced the net in recent days, the full toxicology and autopsy report, a movie trailer for Sparkle and an intervention for her and Bobby Brown’s daughter, Bobbi Kristina. Bobby emphasis on the “y” is facing up to a year for his DUI while RadarOnline reports about the gathering for his daughter’s marijuana, pill, and alcohol problems. As far as her mother’s post-mortem writeup from the L.A. County coroner’s office, a detective found a spoon with a white, “crystal-like substance” in her hotel room. The autopsy revealed that she had atherosclerotic heart disease (caused by plaque in the arteries) and a perforated nasal septum from extended years of cocaine use. Old news is that Benadryl, marijuana, cocaine, cocaethylene (forms when alcohol and cocaine meet in the liver), Xanax and Flexeril were found in her system. 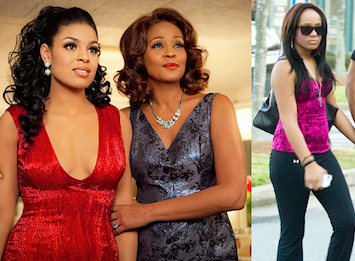 It’s particularly chilling to hear that she was found face down in the tub and and even sadder to see her looking outwardly healthy and bright in the trailer for the Dreamgirls-esque Sparkle, starring Jordin Sparks as her daughter.